Unfortunately, we all must be on guard to protect our personal information from fraud. As a cardholder, you need to take steps to protect yourself from card fraud such as not providing your personal identity information to anyone. Community Bank also helps you to be vigilant against fraud with systems and tools available to you. Mastercard 3-D Secure is an authenticated payment system to improve online transaction security by recreating the high level of security of a physical payment environment by requesting further payment authentication. The goal is to provide a safe and secure online payment experience across Visa, MC, and AMEX systems using a password that is validated by the card issuer and further checked by all other parties involved in the transaction. Community Bank debit card holders are automatically enrolled in Mastercard 3-D Secure. Chip Cards enhance security to protect from fraud on debit cards. All Community Bank debit cards include chip technology for your protection. A microchip embedded in the card adds a layer of protection against fraud for purchases made at the point of sale. Information programmed into the chip is personalized for your account and each transaction generates a unique code, adding an extra safeguard against unauthorized use and counterfeiting. 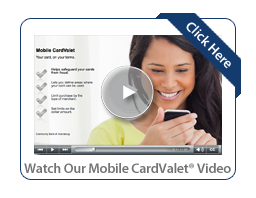 CardValet® is a FREE tool within our mobile app that keeps tabs on your Community Bank debit card 24/7. When logged in to your mobile app simply click on “manage my cards.” This is a great tool for controlling both personal and business spending on your debit card. Review balances and transactions, similar to online banking but with additional features. Control spending by setting limits or merchant types and prevent fraud with alerts or by turning your card off if you noticed it is missing. Text Fraud Alerts is a free service that helps protect you by immediately alerting you of potential fraud on your Community Bank Mastercard® Debit Card through real-time engagement. It’s simple. A text message will be sent to your mobile phone when there is a suspicious transaction identified on your Community Bank Mastercard® Debit Card. If you text “No” to tell us it’s not your purchase, we will text you a number to call or you may call your local Community Bank branch at any time to validate outstanding charges, prevent any further fraud, and start the process of getting a new card. If we do not hear from you, we’ll attempt to verify the transaction by phone. 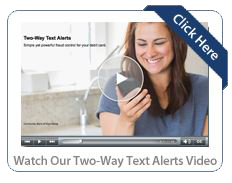 Text Fraud Alerts makes it faster and easier to detect fraud on your card. This fraud protection service is completely FREE to you! SMS text is free to customers with mobile service. Other usage costs may apply based on your wireless carrier. All Community Bank Debit Card accounts are automatically enrolled in Text Fraud Alerts if you have a cell phone on file at the bank. Please make sure your mobile phone number and email address are up-to-date at Community Bank. To submit a new mobile phone number or email address, please log into Community Bank Online Banking and update your information today or call your local branch. Please remember, Community Bank employees will not ask you for personal information in an email or text message (SMS) and will not initiate a call to you on the phone requesting personal information (bank account numbers, credit card number, or debit card number, etc.) without you contacting us first for service. Be vigilant and avoid fraud! Are you leaving the country? Let us know. Due to significant fraud originating from foreign countries, Community Bank protects cardholders by limiting transactions outside the U.S.A. If you plan to use your Community Bank debit card while traveling or purchasing merchandise from foreign countries, please contact your local branch in advance. Contact us about your plans before you leave the country and we will place a travel alert on your debit card. Not contacting Community Bank before conducting transactions with your debit card outside of the U.S.A. may result in a temporary block. We want to be sure you are covered during your travels. Here are some additional tips on protecting yourself from debit card fraud. As always, please feel free to call us at your local branch location if you have any questions.